Using a DENQBAR garden shredder allows you to observe how annoying garden waste can be wonderfully transformed into reusable shredded material by a few simple steps. Our mother earth is a living planet and the circle of nature never stops: the water of a puddle evaporates in the warm sunshine, condenses and forms a cloud. This turns into rain over a summery meadow and seeps as groundwater. Plants absorb the water and nutrients of the soil and bloom in colourful splendour. They in turn serve animals as a source of food. From microorganisms to heavy blue whales: All life is interconnected. "Die and become" - without this fact, the circle of life would not work. For if the smallest microorganisms did not decompose the deceased life into essential nutrients, no new life would be possible. As if you put something into a shredder, eventually everything will be dissolved to its smallest components. The local garden is literally a symbol for all the world to see, with which we can experience the marvellous natural cycle up close. With dedication and the love of nature, you can become part of a healthy whole with simple means! Garden shredders are an important basis for new life in every garden, as flowers, shrubs and trees only thrive in full splendour, if sufficient minerals and trace elements are supplied. Cut branches, shrubs, etc. are not only shredded quickly and efficiently in the garden shredder, the shredded material also forms the raw material for valuable humus. That is why compost from shredded garden waste is rightly considered to be the oldest organic fertilizer in the world. With the multi-award-winning garden shredders by DENQBAR this preparatory work is especially easy. Powerful hammers and knives form a perfect interaction. With the innovative gasoline engine of the latest generation all inserted plant remains are easily shredded. The engine works very environmentally friendly and still has plenty of power. Experience the fascination of gardening! Because nothing is more pleasing for the hobby gardener than his green paradise in harmony with nature. He will be even more proud if he has created this paradise exclusively by natural means. >DENQBAR - that's the way it works! A garden shredder creates space in your garden. Tree, hedge and shrubbery cut is bulky and voluminous, additionally there are withered flowers, leaves and other plant remains in your garden. A garden shredder creates space and order. The shredding process reduces the starting material by up to 75% on average. In a normal sized garden of 800 m² on average 100 m³ of plant material is accumulated. In order to master these amounts, the volume reduction by the garden shredder is the best solution. Saving money with the garden shredder. A garden shredder not only creates more space in the garden, it also saves money. The garden waste would have to be disposed of expensively. 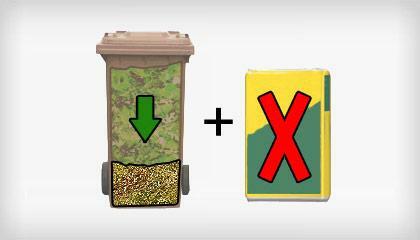 As the "bio-bin" is more relieved, the volume reduction of up to 75% also guarantees a financial benefit. But the shredded material can be used even more profitably – by using it as free fertilizer. The shredded material is ideal for composting and returns valuable nutrients back to the soil as fertilizer. You do not have to buy expensive artificial fertilizer anymore. In forests, dead plant residues serve as natural protective layer and fertilizer for the soil. It protects the soil against erosion in the rain, against excessive dehydration due to solar radiation in summer and isolates the soil from frost in winter. By spreading shredded material as a thin layer above the ground, you can achieve such a protective coat as well in your garden. It also prevents weeds from germinating. Crop and ornamental plants are better protected against pests and diseases. Similarly, small microorganisms live in this layer and process the plant remains to valuable humus. Close the cycle of life in your garden, through dead material, finely shredded, your garden gets a makeover. Upgrade shredded material to fertilizer. The nature itself offers an excellent example: compost from shredded plant remains. With compost, the nutrients and trace elements consumed by the plants are returned to the soil. Using the right mixing ratio, you can produce optimal fertilizer helping plants grow faster and making them more robust. 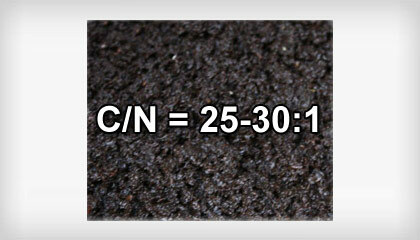 The ideal ratio of carbon to nitrogen is crucial, ranging from 25 to 1 to 30 to 1. For foliage the ratio is between 30 to 1 and 60 to 1, for grass cuttings 12 to 1 to 25 to 1 and for mixed garden waste 20 to 1 to 60 to 1. When the composting process is completed, you get fertile soil, smelling as pleasant as forest soil. 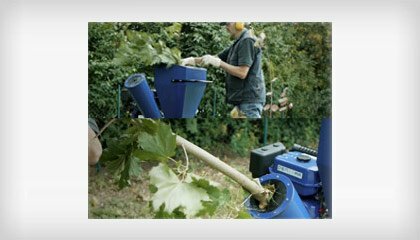 With a DENQBAR garden shredder all plant residues as well as garden waste can be processed. There is a distinction between hard and soft material. Hard material consists of branches, twigs, hedges and shrubs. 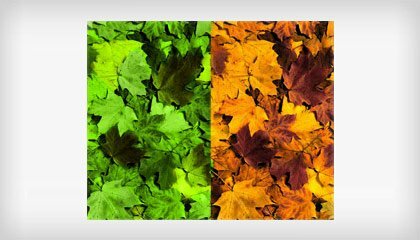 Soft material consists of leaves, vegetable and fruit residues and flower and grass waste. Both varieties usually accumulate in gardens and form the ideal basis for well mixed shredding material. 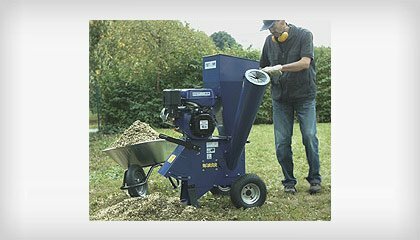 Our petrol-driven DENQBAR garden shredders offer a hopper and a chipping chute for each purpose. Is a garden shredder worth it also in smaller gardens? Whether large or small - Regardless of the size of the garden, a garden shredder is always worth it. It is not always depending on the size, but on the type of planting. 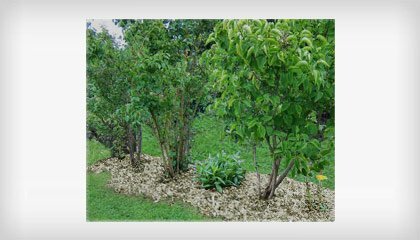 Even in small gardens a lot of shredded material accumulates when they are planted with trees, spreading shrubs, dense hedges and perennials. Especially in smaller gardens, where there is little storage space for old foliage and tree or hedge trimmings, a shredder is quickly and effortlessly creating space. Of course, the peak season for the garden shredder is in autumn. The garden has to be prepared for the coming winter, for starting the next gardening season in spring. Trees, shrubs and hedges are getting trimmed, the fallen leaves are collected and the lawn has to be mowed for the last time. In autumn, most plant residues thus incurred which can be shredded and recycled. But even in spring, when everything is starting to bloom again, you are sprucing your garden. In summer, proliferating rose bushes and clematis have to be trimmed. These clippings are then chopped into high quality structural material for the compost or fertilizer. 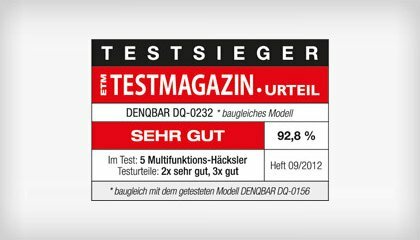 The DENQBAR 15 HP garden shredder was named test winner by the ETM test magazine in comparison with other well-known brands. Even the current successor is awarded as test winner like its predecessor. If you are looking for the "Ultimate Garden Shredder", as entitled by the trade magazine, then the DENQBAR 15 HP garden shredder is the best choice. Also the smaller 7 HP garden shredder is not inferior to its "big brother" in terms of quality. Safety is an essential criterion when using a garden shredder. 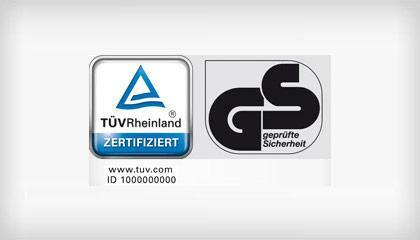 The DENQBAR garden shredders comply with the latest machinery and safety guidelines and are certified by independent testing institutes such as TÜV Rheinland. The design of our DENQBAR garden shredders is in accordance with all crucial health and safety factors. Two feed hoppers have been installed. The side funnel is used for thicker branches and bushes. An additional knife ensures especially fine shredded material. Undergrowth, leaves and other smaller garden waste are inserted via the large main funnel. This separation avoids blockages of the shredder. The shredder is used to shred various materials. 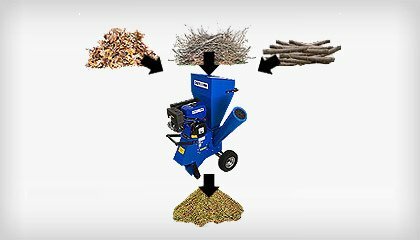 A garden shredder is a device shredding natural materials produced by tree, lawn or hedge trimming. The shredding system crushes, grinds and triturates the raw material into compostable material. Thus, the garden shredder not only contributes to reducing the volume of garden waste, but also recycles this material, for being reused as bark mulch, fertilizer or structural material. Garden shredders with petrol engines offer you the advantages of grid-independent use and more powerful shredding than electrically powered garden shredders. With our powerful gasoline garden shredder / wood chipper in the versions with strong 5.1 kW (7 HP) or 11 kW (15 HP) petrol engine, you can shred sawn wood, branches or waste of almost any kind. In terms of safety and efficiency, you can rely on your DENQBAR gasoline garden shredder.